A couple of weeks ago, I was having a chat with a friend and one of the hardest questions a food lover will ever have to answer was asked. "If you had to eat the food from one country for the rest of your life, where would it be?” I paused for a little while, but in truth, I knew the answer straight away. Not because it was an easy answer, but because I had thought about the answer to this question on many occasions, and on every occasion, the answer would be Italian. Surprising maybe, being that I am Chinese, but nothing excites me more than the variety and produce from "The Boot". When the offer to take part in a Carbonara taste off arrived in my inbox, I jumped at the chance. In one corner, we have Marco Torri, head chef at Semplice and proud owner of a Michelin Star. In the other, we had Jane Hornby cook, and author of "What to Cook and How to Cook It", a brand new cook book, packed with straightforward recipes all beautifully visualised. This was going to be an interesting contest. After some chat with both "contestants" and keeping our hunger at bay with focaccia, olive oil and cured meats, the chefs headed off into the kitchen to prepare their dishes. When they both arrived, you could see that they were both very different. The first one we were presented with was much wetter with a heady aroma. 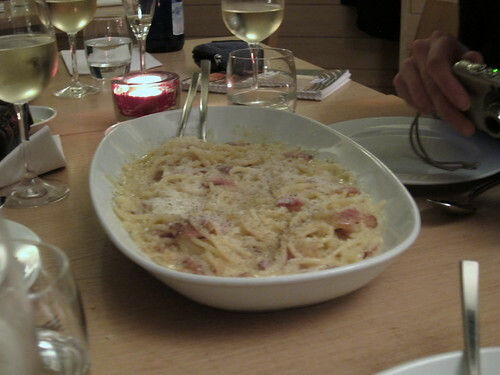 The sauce was deeply savoury packed with a good strong cheesy punch, not of parmesan, but of Pecorino, we all decided. A smoked ham perhaps? Definitely a few ladles of pasta stock into the sauce, a chefs secret I once saw on the telly. The second was a lot less saucy and much milder in overall flavour. The sauce was definitely thicker and the ham used was much milder, without as smoky a hit, definitely less pepper. I actually preferred this one; it wasn't as much an assault on your senses, but a comforting bowl of pasta. It turns out the second one belonged to Jane, but both were very enjoyable and the fact that both troughs were emptied of their contents was all the chefs needed to know. We had a leaf through Jane's book and the recipe was there in all its glory, well illustrated and simple to follow. 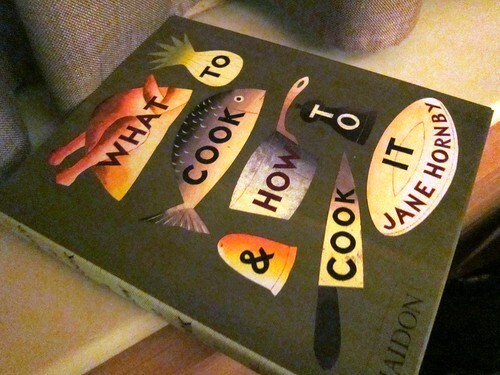 I have attached Jane's recipe at the bottom of this post so have a go yourself, and I would definitely recommend getting hold of a copy of "What to Cook and How to Cook it". You won't regret it. Just six ingredients come together to create something quick and indulgent. For an extra touch of luxury add a dash of cream – just two tablespoons or so – to the Parmesan and eggs before mixing with the pasta. Put a large pan of water over a high heat and bring it to the boil. Add the salt, then add the spaghetti and bring back to the boil. Stir once, turn the heat down a little, and boil for 10 minutes, or until the pasta is just tender. While the pasta cooks, start the sauce. Squash the whole garlic clove without peeling it. You can do this by simply bashing it with the bottom of a pan. Chop the bacon into small pieces, if using. Heat a large frying pan over a medium heat, then add the oil. After 30 seconds, add the chopped bacon or lardons and the garlic. Fry the bacon and garlic for 8–10 minutes, or until the bacon is golden and crisp and the fat has run out. Discard the garlic and take the pan off the heat. While the bacon cooks, finely grate the Parmesan cheese and beat the eggs in a jug with a fork. Mix half of the Parmesan into the eggs. Season with salt and pepper. When the pasta is just tender, reserve a cup of its cooking water, then drain it in a colander. Tip the pasta into the bacon pan, add 2 tablespoons of the reserved cooking water, then pour over the egg and cheese mixture. 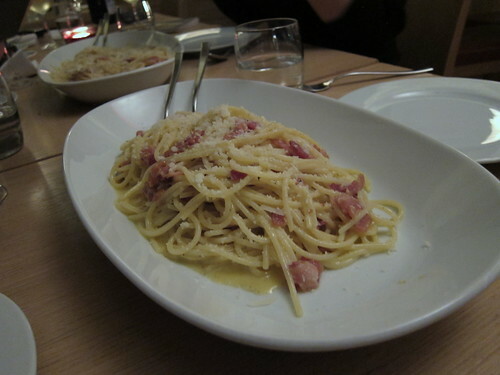 Toss everything together quickly (tongs are useful here), so that the egg mixture, bacon and its juices coat the pasta. The residual heat in the pan and the pasta will be enough to just cook the eggs to a creamy sauce within about 1 minute. Scoop the pasta into warmed serving bowls, then sprinkle with the rest of the cheese and a little black pepper, and serve immediately. You can't beat cheese, bacon and pasta... poifect!